Choosing the right security solution is critical to the success of an online business. Secure Sockets Layer (SSL) was invented at the dawn of e-commerce to address security challenges with data encryption. It was a key ingredient in the rapid growth of online business in its early years. However, as with all technologies. It is critical to choose e-commerce security solutions that continually evolve and extend to address a range of ever-changing needs. 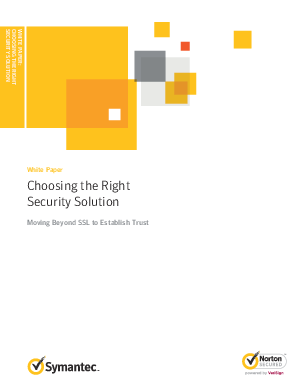 Look for trust-based security solutions from established vendors, like Symantec, that deliver protection and consumer peace-of-mind through cutting edge technology and integration with complementary third-party solutions.